still frown at the mention of it. Back in its time, The Wizard of Oz was an innovative film, having a great impact on the film industry; similar to the affect Majora’s Mask had on the gaming community. 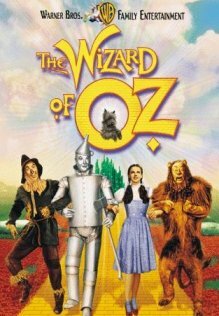 Today, The Wizard of Oz has the status of one of the greatest films of all time, although its original reception was similar to that of Majora’s Mask. Many people claimed it as a favorite, while others turned away. which aim to communicate the same moral lesson. One of the cover designs for the DVD release of the film. has been influenced by icons of popular culture from American history. 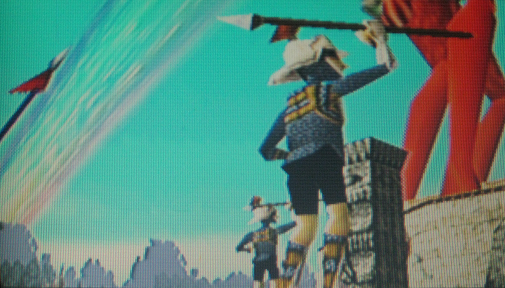 Guardians of the land, therefore stopping the moon, and defeat Majora. for Navi and returns home to Hyrule. which warps Dorothy and her house to the magical land of Oz. from Glinda, The Good Witch of the North. the twister has passed through and no one is harmed. companion, Navi, whom he had been through many trials with. Dorothy with her dog, Toto, and Link with his fairy companion, Navi, from Ocarina of Time. someone until they’re gone. Dorothy likewise came to this realization. Dorothy sees her Aunt Em in the crystal ball and Link remembers his parting with Zelda. Link, who never says a word, Dorothy shares the lesson she has learned. where he most likely fulfills Zelda’s words, being amongst his friends. from the Happy Mask Salesman. needed to search, as he should return to those he does have. hope that such petty plans would diminish. Dorothy sums up what she has learned and the Happy Mask Salesman bids Link farewell. think, and how they feel, is much more important than your own desires. to learn it for herself.” The final line of The Wizard of Oz sums up both the message of Majora’s Mask and of itself, in a quote that the movie has made a famous catchphrase today. The message is not the only similarity between Majora’s Mask and The Wizard of Oz. generates an environment where they are gone, but everyone else remains. don’t witness everyone in both worlds. show that Oz parallels aren’t human as they are in Termina. Scarecrow, Tinman, Dorothy and Cowardly Lion on their way to Emerald City. Tinman and Cowardly Lion, who she promptly helps with their problems. recognize her three friends; however she states that they seem familiar. accentuate the message of appreciation. far as villains go, there isn’t a correspondence between Majora’s Mask and The Wizard of Oz here. Majora bears no resemblance to The Wicked Witch of the West. Mask Salesman and Skull Kid, who can travel between Hyrule and Termina. wizard and ruler of the land. The Wicked Witch of the West, and the Wizard of Oz before he is exposed. link to his human form. Both state that it is a straightforward task. above. Both Dorothy and Skull Kid got this reception. seemed like days to her. 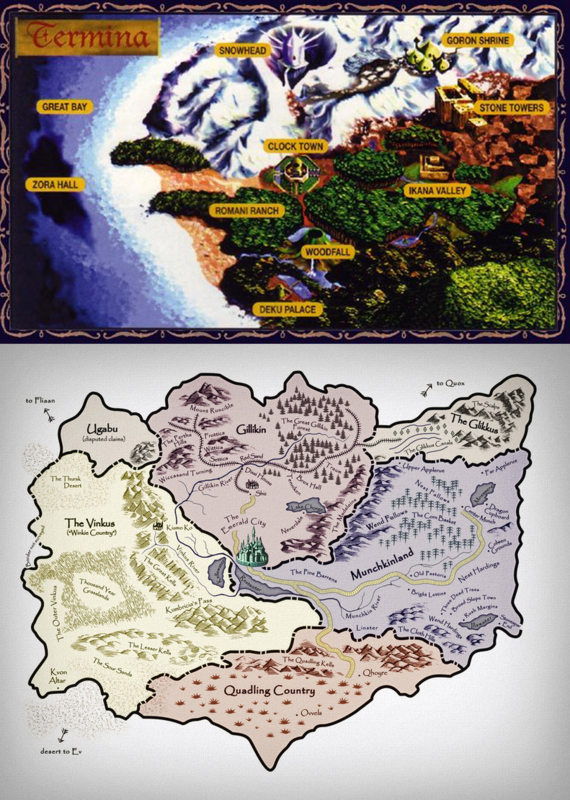 These maps show the geographic similarities between Termina and Oz. mysterious ones as they cannot plausibly occur. friends and family are gathered around her bed. The various portals that lead to Oz and Termina. 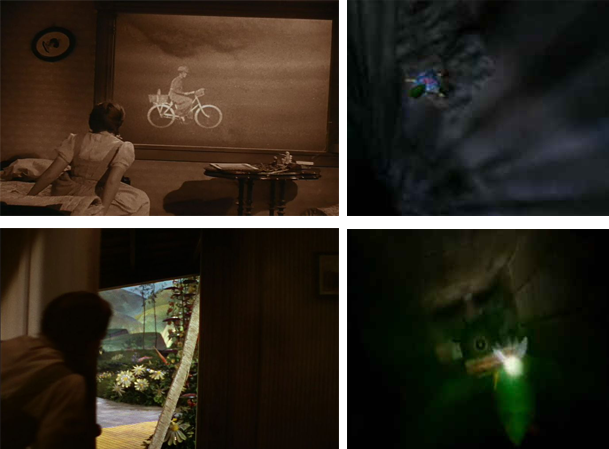 Top Left: Dorothy looks out her window as her house is in the twister. Top Right: Link falls into the abyss in the Lost Woods. Bottom Left: Dorothy opens the door of her house and gazes into Oz. Bottom Right: Deku Link and Tatl travel through the winding corridor into the Clock Tower, closing the metal door. ending shows Link riding back through the Lost Woods, not waking up. Nintendo made it clear that Link’s Awakening was a dream, and would’ve respectively done so in Majora’s Mask, if it was a dream. The original book that The Wizard of Oz is based on implies that it is a real sequence of events. to calm Dorothy with that assumption, though we know it wasn’t. Dorothy is back at home amongst her friends and family while Link rides towards Hyrule. is checking she made it back to Kansas safely. differences between it, and the memorable game, Majora’s Mask. twenty minutes, it probably went for twenty minutes.